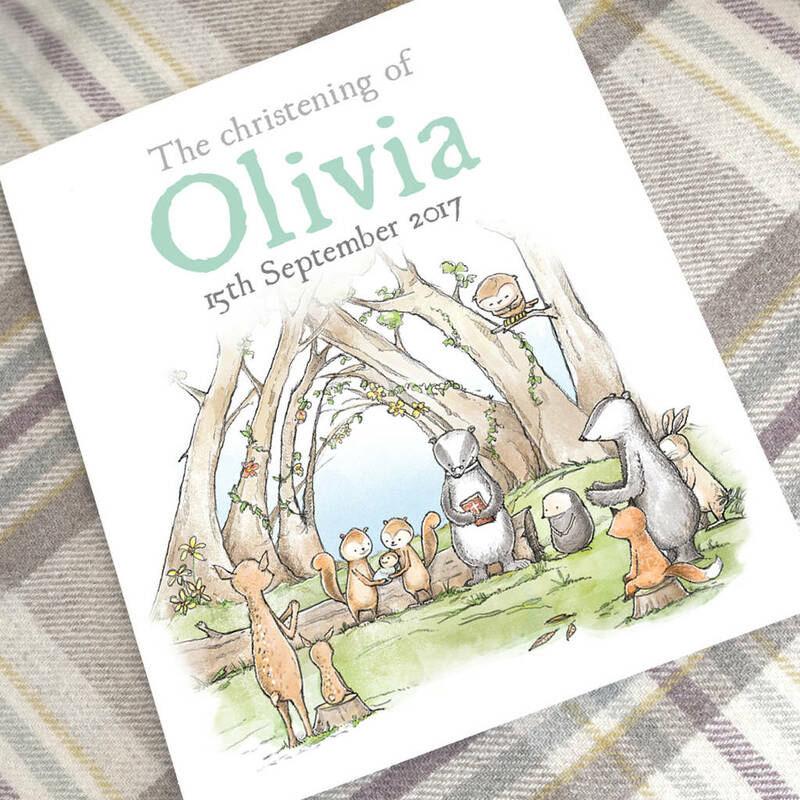 A gorgeous keepsake to celebrate a special day - the story of your child's christening or baptism illustrated with adorable woodland animals. Now available in Hard or Soft Cover. 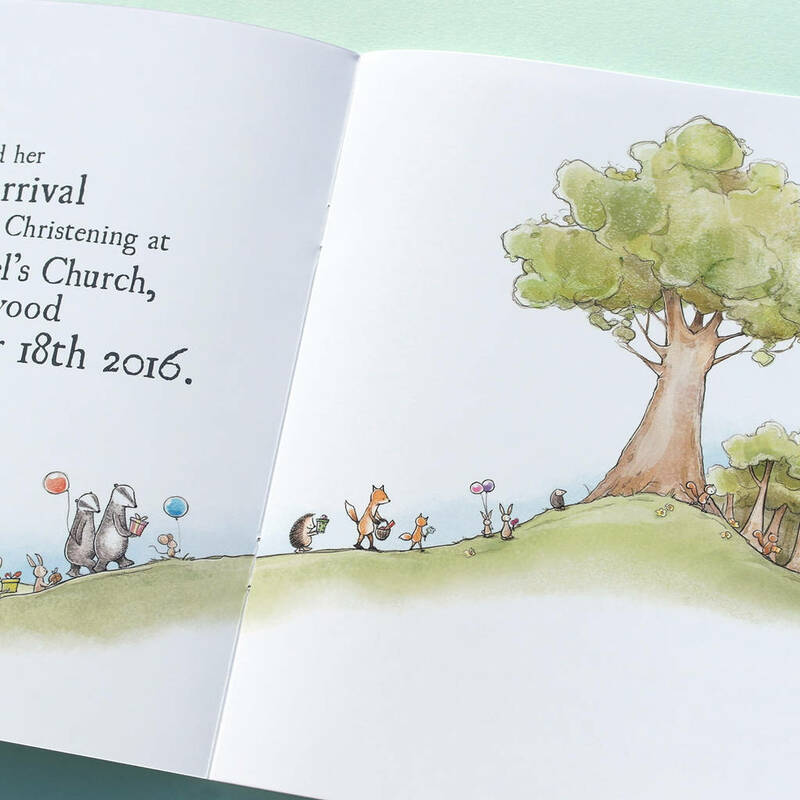 Personalised throughout with your personal information and hand-coloured illustrations of a squirrel family with their woodland animal friends, the book includes all the details of the baby's christening or baptism. 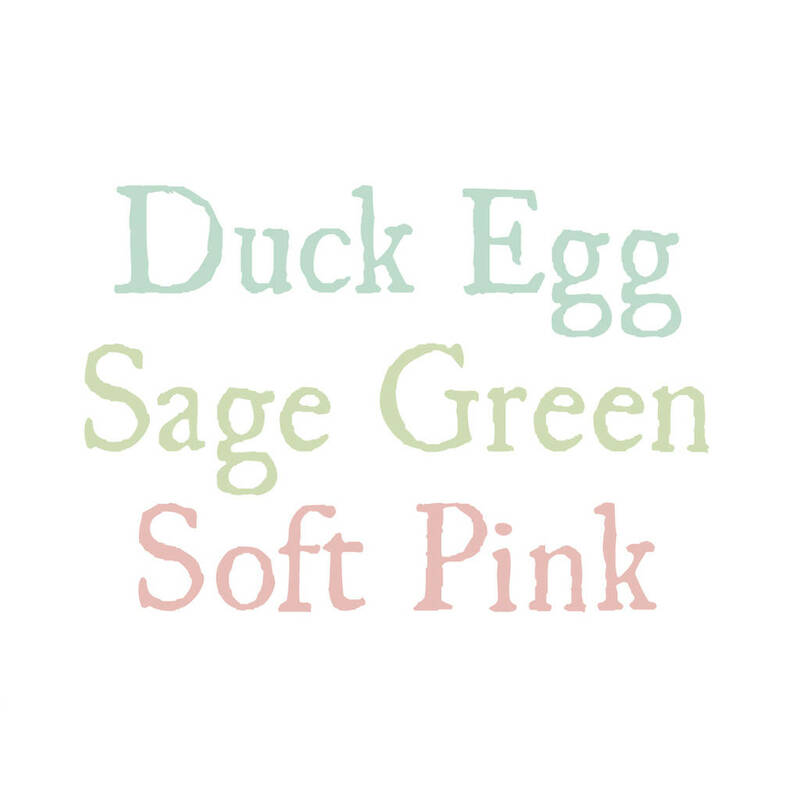 The text colour for the front and inside cover can be duck egg, sage or soft pink. On the inside front cover we print a personalised message so they can treasure the personalised book in years to come - for example, "Happy Christening Day, love Aunty Ruth". 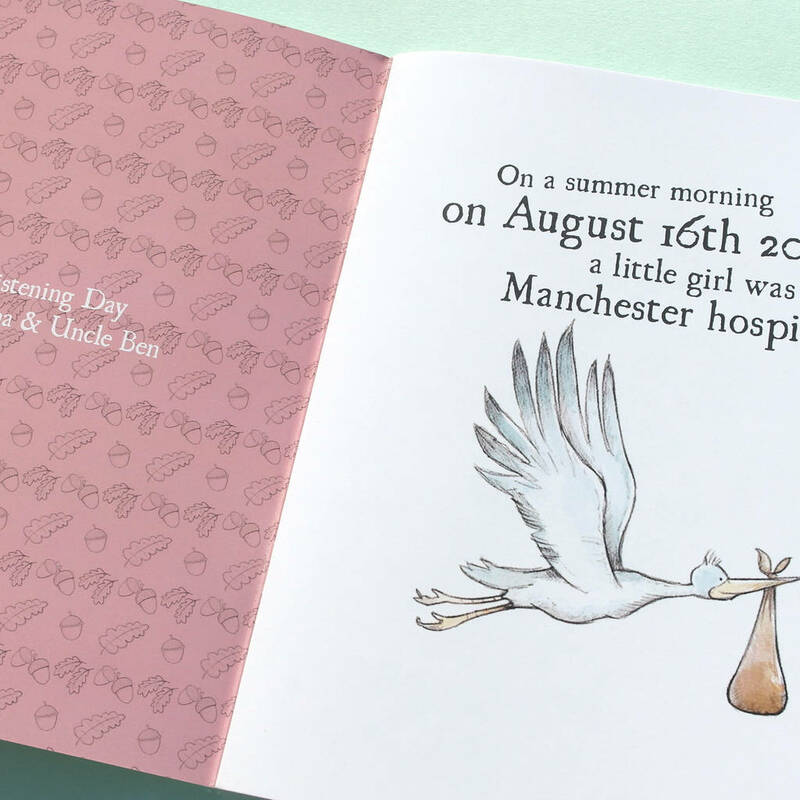 On a Summer Day (pick season) on (date of birth eg: July 15th 2017), a little (girl or boy) was born in (place of birth eg: Manchester hospital). 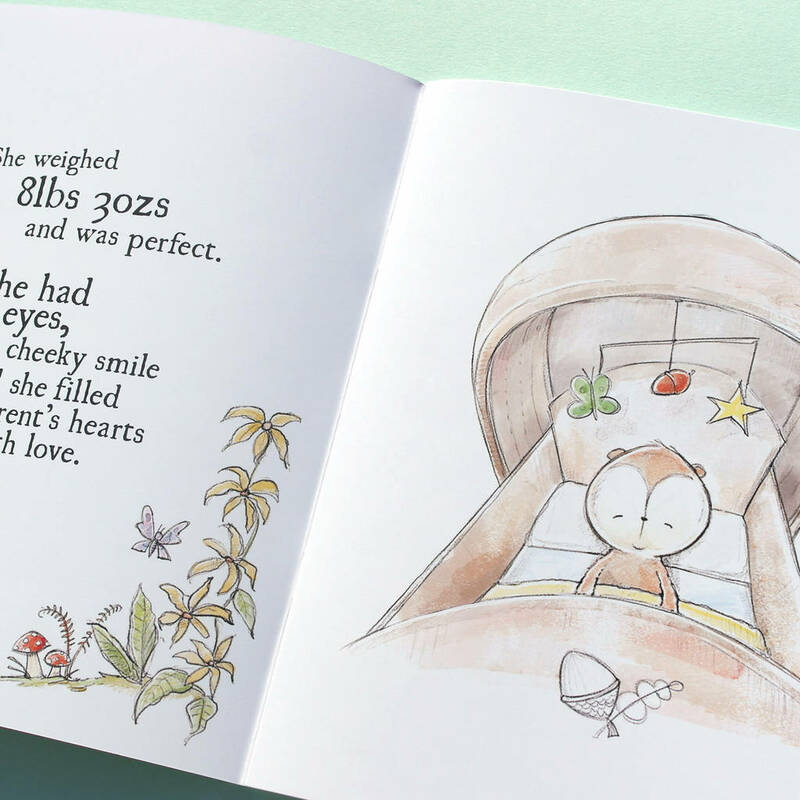 She weighed (birth weight) and was perfect. She had (colour e.g. : blue) eyes, a cheeky smile and she filled their hearts with love. They named her (child’s full name). 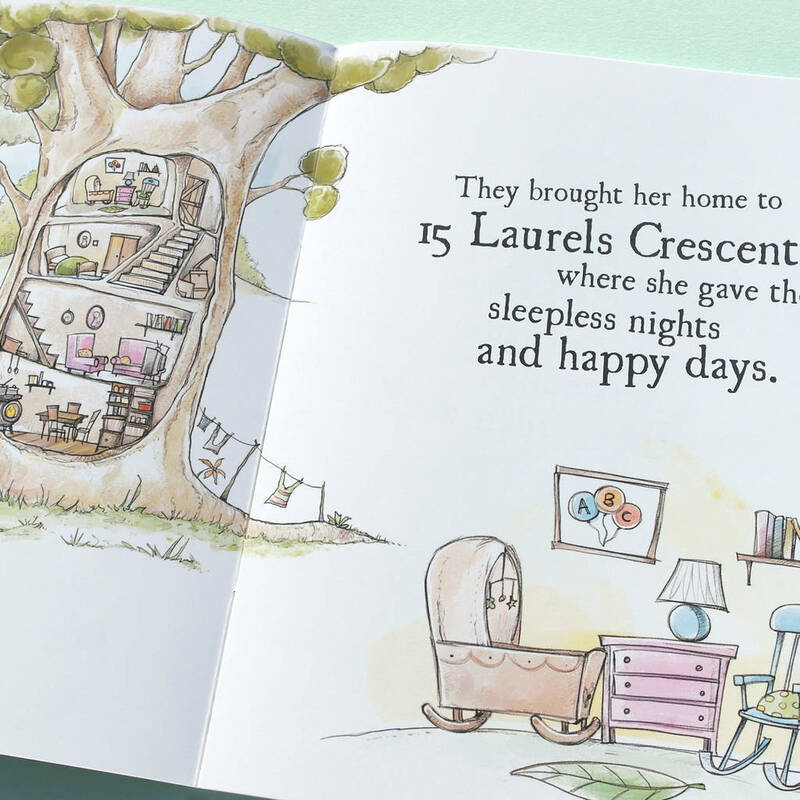 They brought her home to (street address eg: 15 Laurels Crescent) where she gave them sleepless nights and happy days.They celebrated her precious arrival at her (type of event e.g. 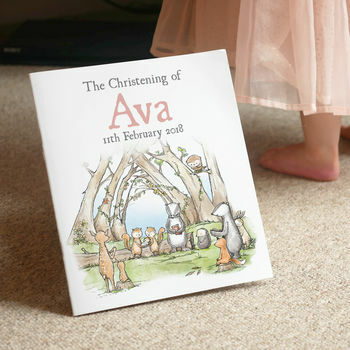 : Christening) at (venue) on (Christening date). She was joined by (family and friends or names of guests e.g. 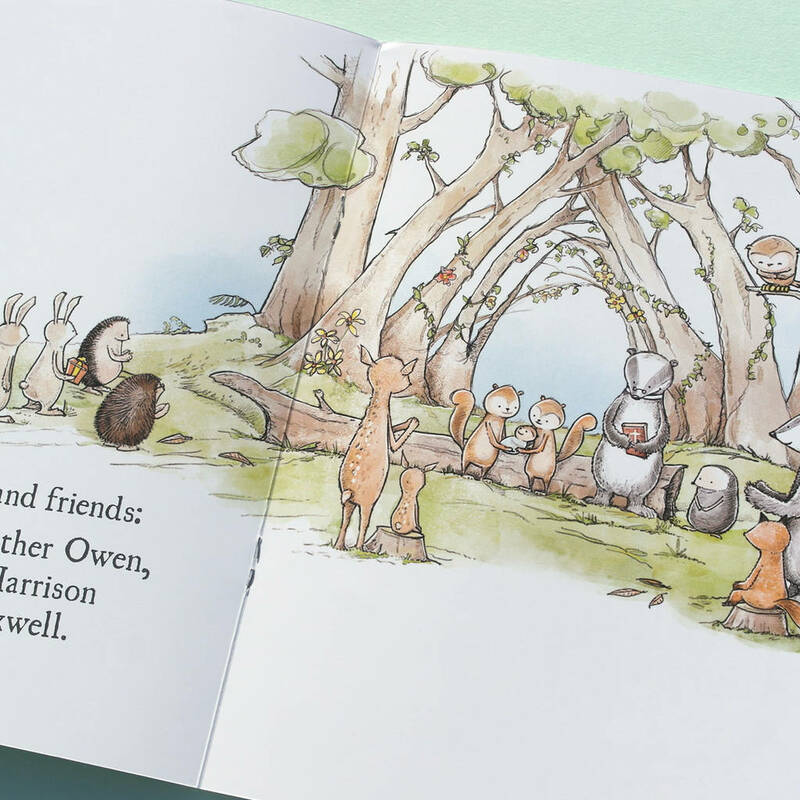 : Mummy, Daddy, brother Owen etc). She was loved by her Godparents: (names of Godparents). 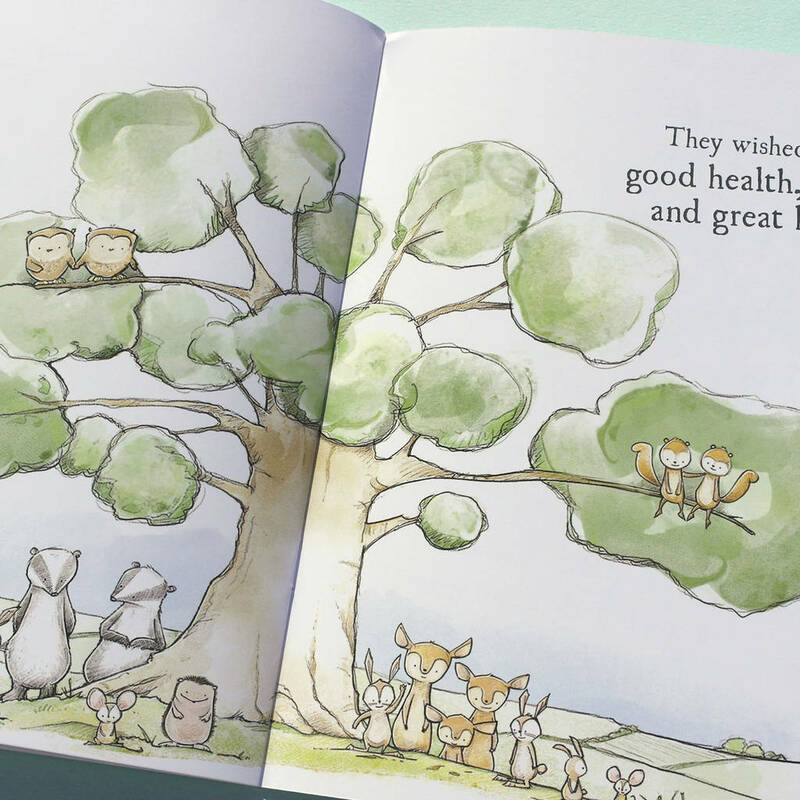 They wished her good health, good luck and great happiness. Her family and friends watched her grow with pride and love, knowing she was happy and loved by all. 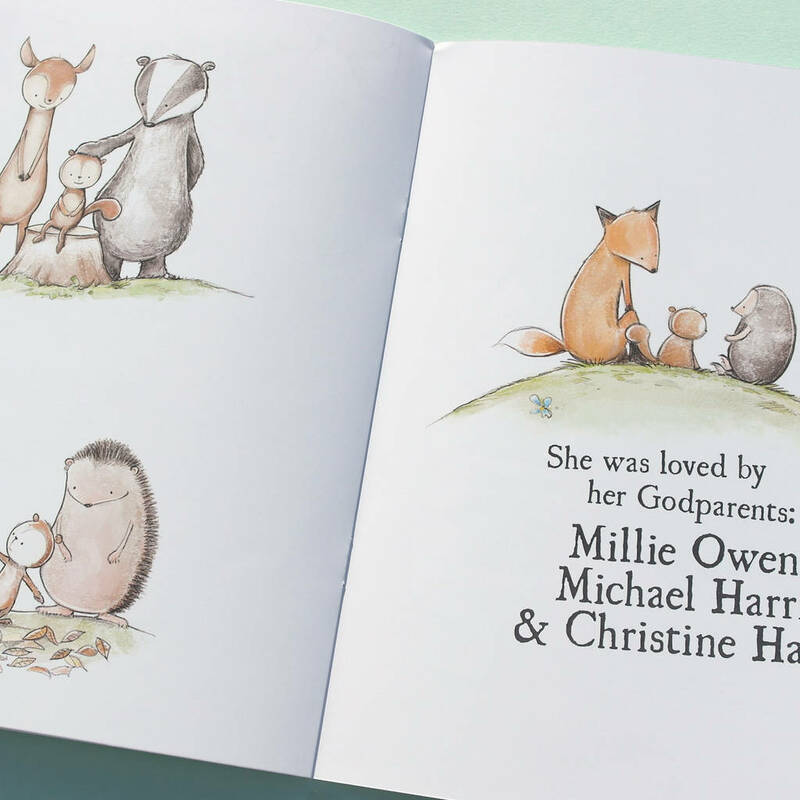 Happy Christening (or Baptism etc) Day (name of Child) love (who book is from eg: Mummy and Daddy). 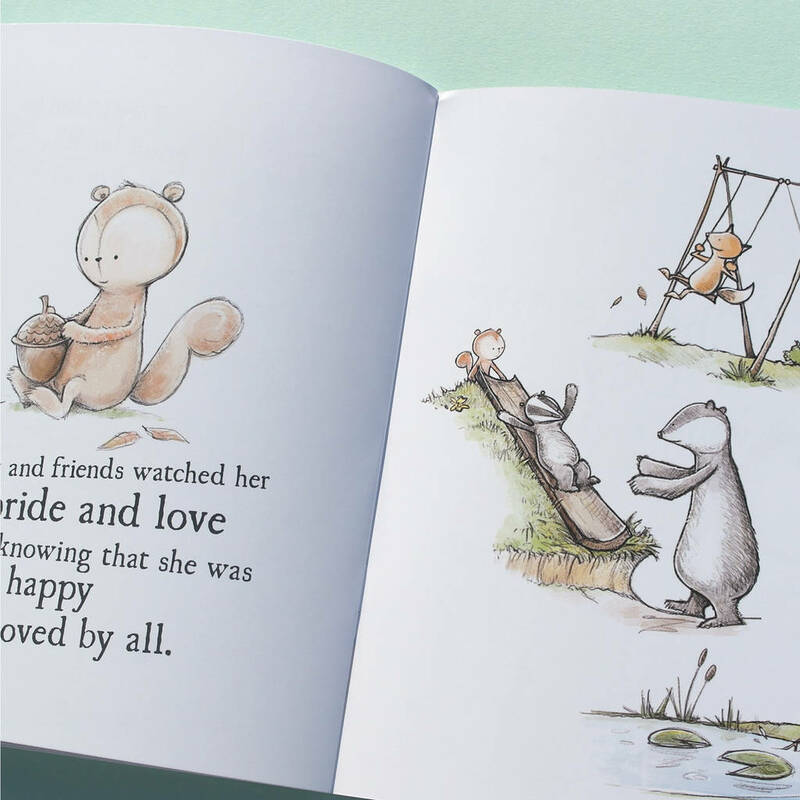 Each paperback book is printed to order with bright vivid colours on heavyweight paper and a matt laminated cover to protect your book. 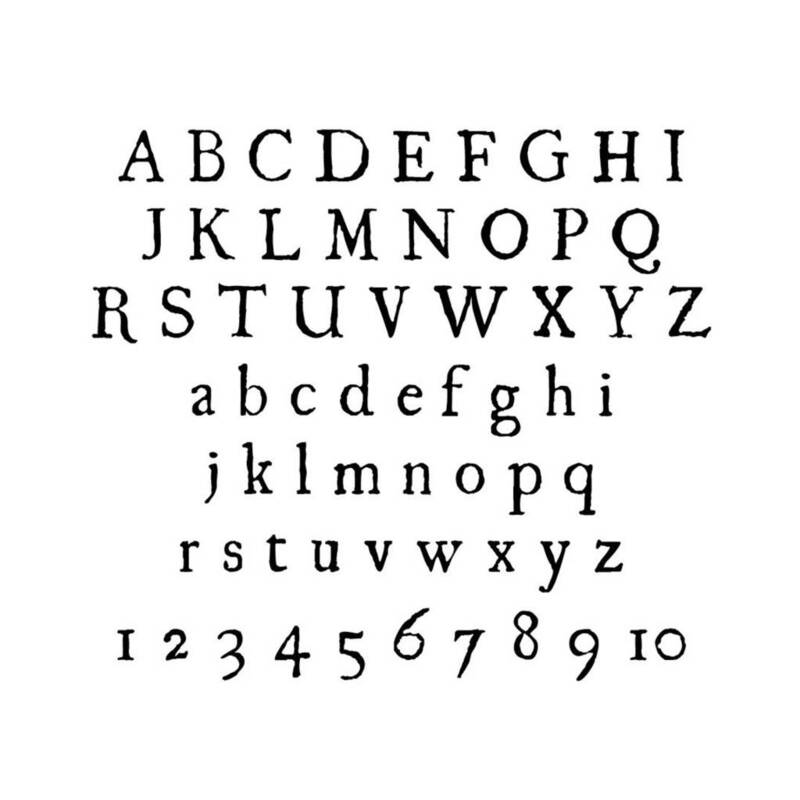 Letterfest was also shortlisted for Gift of the Year 2015 and is Winner of Creative Business of the Year 2011, Best Customer Service 2012 and Children's Gift of the Year 2016.